This is my first ever post. Please be gentle :) I reckon a good deal even though these are going for about £150, decent looking creps. That’s what I always think these are a good saving for people wanting them. It’s a shame they pick up some many cold votes. 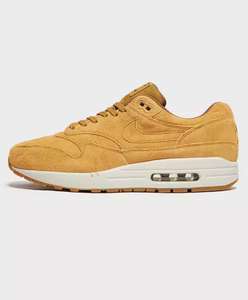 I know they are reduced at Nike.com but these are still saving over £20 more. Never miss a 'Nike Air Max' deal again! Got these for 64.99 100 on Tommy Hilfiger website Not everyone taste but there different. This hoodie was only in size L age 12-13 They had other hoodies for £12 in XL just not this one, so really you need to be in store to see what designs they have. But hopefully someone will come along who can help. I thought ‘I found lots of these Nike Air Max Hoodies in store at the Nike Clearance Store Junction 32 Castleford’ Would be enough for local people to know where’s I was taking about and for those non local enough information to google it’s where about’s. But i’ve taken note and my next post from my favourite Nike store in Castleford will have the full address and postcode. The first ones look good with grey jeans. They are understated but definitely give you a height boost too above what they look, maybe 4cm? I’m not sure why, but your comment is coming off kind of aggressive towards me and I’m not sure why. Yeah I was surprised a international company as big as Nike didn’t deliver I had a quick google as you said and it appears they aren’t the only ones. I was surprised how many don’t. I was going to try an offer a solution around the issue like footasylum &amp; footlocker who regularly have good reductions on Nike trainers. Early members release and possibility of selling on for profit. I had no option but to pop across to Castleford but the manager there was top notch. He inspected the trainers and immediately acknowledged there was a problem. It was a bit of an inconvenience but at least it got sorted... Unfortunately there wasn't anything suitable as an alternative, so it was just a refund! Have been to this store before. Their sales are very sporadic, but if you get them at the right time, there are serious savings to be made. Bought football boots (studded and astroturf) for the boy for a fiver a pair in the past. Properly good deal when the same shoes are £30+ at Sports Direct. As an added bonus, I also didn't have to go to Sports Direct. The Nike Air Max series has attained iconic status among footwear fans. It was first launched way back in 1987, when US street culture, hip hop and basketball first gained a foothold in the UK market. Air Max trainers were immediately set apart from other models by the innovative air cushion beneath the heel, which makes them some of the most comfortable (and sought after) shoes available. 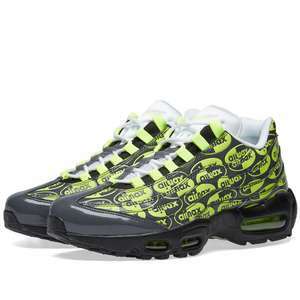 Since its launch, the Air Max range has gone through several redesigns, including classics like the Air Max 95 and the Air Max 360 – all of them equipped with the advanced shock absorbing properties that have made them one of Nike’s most enduring models. In 2015, Nike organised a kind of anniversary celebration to highlight some of the most successful Air Max designs, ensuring that their wide selection of different models is available for buyers to choose from. 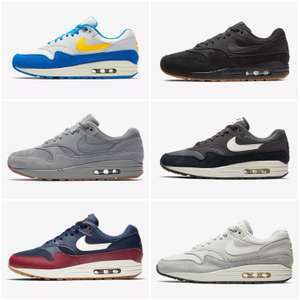 With such a wide choice of models to choose from, it helps to break down the Nike Air Max range into different options. First of all, think about the kind of upper you want on your shoes. This is the part of the shoe that lies above the sole, so it’s the part that will be most visible. Having an eye-catching upper is essential to creating the right sportswear look, so take some time to choose wisely. Mesh uppers – This variety features fine mesh netting across large areas of the upper. The mesh allows air to circulate freely from the interior of the shoe, cooling the wearer’s feet. This makes them ideal for wearing in hot climates or for using during sports like basketball or running. Suede uppers – These classy leather uppers are made to show off and to keep your feet warm and dry. They can be customised by colour, creating a dazzling blend that suits your own unique personality. Full leather uppers – The premium choice for your Nike Air Max trainers. Full leather uppers are the most resistant variant and add a touch of distinction to your footwear, turning street shoes into items that can be worn at bars and parties. Choosing the right colour is just as important as selecting the ideal upper. Nike are justly famous for producing their shoes in vivid colours, and their bold mixtures of purple, pink, orange or green can be seen on almost any city streets these days. The first thing to choose is the base colour. Aside from the iconic red and black design, you could go for neon orange or yellow, grey, navy blue, white, pink or green. The exact base colour you choose is down to your personal taste, but remember that darker colours generally hide the dirt better, which is ideal if you’re going to use them for sports, and may be easier to maintain in peak condition. Then again, any dirt can be seen more easily on white or grey shoes, allowing you to clean it off before it becomes encrusted. After choosing the right colour, you’ll need to choose the patterns that you want on your Nike Air Max shoes. Your options stretch from bright salmon women’s running trainers through to all-white tennis-style shoes, dark blue and green colours for social occasions, shiny silver and gold trainers, and glow in the dark neon varieties. There are Safari designs featuring exotic animal prints. At the other end of the style spectrum, there are also patent black leather trainers that could be ideal for people who want to stay comfortable during their commute to work. There are even brown suede boot-style options for extra heel protection, as well as Air Max that are decorated with graffiti-style designs – the ideal option for skateboarders and urbanites. One thing that is unusual about Nike Air Max shoes is that they never come in narrow sizes. That’s not the way they were designed. 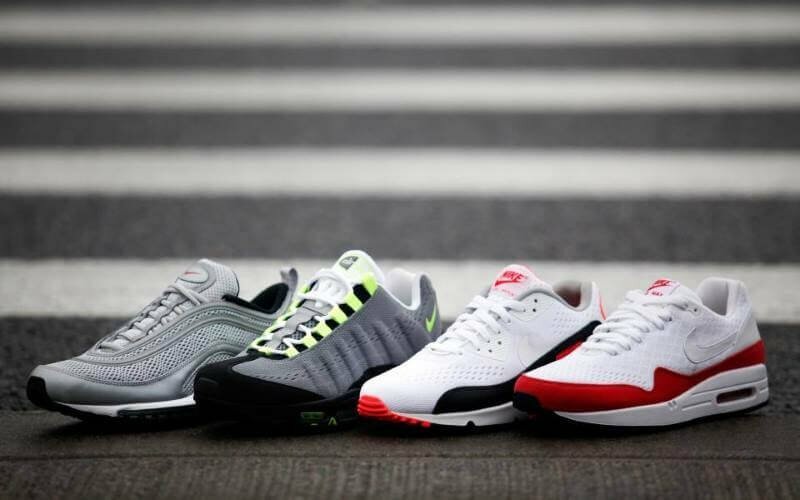 Instead, you can choose from regular or wide fits, in keeping with the urban sports style appearance of the shoes. UK sizes range from 6 to 13. In US terms, that’s a range of between 8 and 14, so bear that in mind if you are purchasing from online sellers who advertise in American sizes. Women’s shoes will also be a couple of sizes smaller, so be sure to purchase the right shoe size for your feet. To be even more precise, follow Nike’s guidelines on establishing your shoe size. Stand up against a wall and use a piece of paper to measure the distance from your longest toe to your heel (the heel-to-toe measurement). A length of 24.5 cm translates to size 6, rising to 30.5 cm for size 13, charts can be found online to make any conversions. What Classic Models of Nike Air Max Are Available? The Nike Air Max 87 / Air Max 1 (1987) is probably the most historic and recognisable model in the Air Max range, but online buyers can choose from plenty of other designs as well, including many that Nike have resurrected for the anniversary celebration in 2015. The Air Max 90 has a slightly sturdier structure, with an even larger air cushion and plenty of mesh to provide ventilation. The Air Max 180 came out in 1991 and was an update from Air Max 1 designer Tinker Hatfield. This time around, features included a “sockliner” to mould the shoe to the exact shape of the wearer’s feet, providing an unprecedented level of comfort. The futuristic looking Nike Air Max trainers from 1993 extended the visibility of the air cushion a whopping 270 degrees, so that it stretches all around the back of the sole. 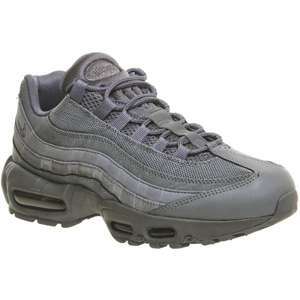 The Air Max 95 took a completely new aesthetic direction, with visible air pockets at the front of the shoe as well as the rear. This was coupled with stylishly ribbed uppers and advanced fibres that provided even more ventilation. 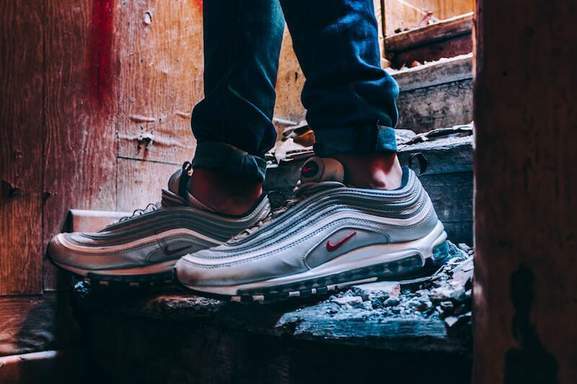 The Air Max 97 extended the mesh even further, turning it into a ripple across the top of the upper, while also making the air cushion more visible than ever. In the new millennium, the Air Max 2003 moved away from older materials, utilising a new fabric called Teijin, making the trainers even lighter and more resilient. The Air Max 360 came next, borrowing some stylistic elements from the original Air Max 1, but adding more performance via thermo-moulding technology. The bold Air Max 2015 offers very breathable materials and deep grooves in the sole for extra grip while shooting hoops. What Can I Use My Nike Air Max Trainers For? The Nike Air Max range was originally intended to be a bridge between urban fashion and sporting performance, so your shoes will be suitable for a wide range of activities. 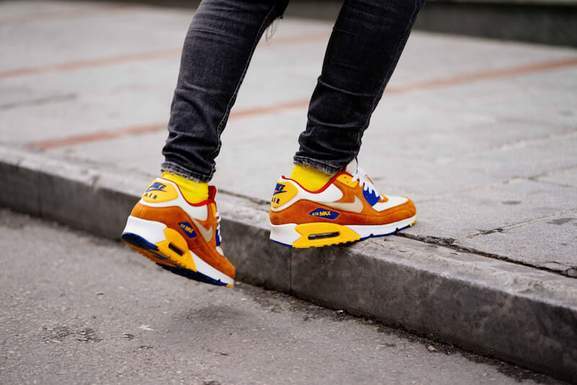 Although the Air Max 1 was designed with basketball in mind, the popularity of the shoe has been credited with sparking a revolution in jogging, inspiring millions of people to take up regular running as part of their fitness routines. Your Air Max trainers will be perfect for light jogging, thanks to their breathable design and the comfort provided by the air cushion. However, experienced long distance runners may want to find something that is tailored to their specific foot shape and gait. Nike Air Max trainers are great for short runs and for people who want to use their running shoes for everyday tasks, but they aren’t ideal for running marathons. They have also been associated closely with footballers (Barcelona star Neymar has endorsed his own design), and you can play a decent game of football in them. They won’t be great for playing on grass, as they offer only a modest amount of grip, but they are well suited to astro-turf. The same applies to all sports. Nike Air Max shoes are generally excellent for indoor sports like basketball, but less useful if extreme grip is needed. But Nike Air Max trainers are not all about playing sport. They are also a style icon, and can be used as a key part of a dynamic urban or sportswear based look. Models like the all-gold Air Max design, or shoes with graffiti prints are designed to fit into urban collections. There are also models of Nike Air Max that can be worn with suits or even tuxedos. Go for an all-black or grey pair to give yourself a footwear choice that keeps you comfortable on buses or trains as you travel to work. How Can I Buy A Pair of Nike Air Max Trainers? Shopping online is a great way to find a cheap pair of Nike Air Max shoes, so look around and find a deal that meets your budget at retailers like JD Sports, Argos, Amazon, Sports Direct and – of course – the Nike store. Although sales are ongoing, be sure to check the listings after Boxing Day and New Year, when Nike usually offers huge reductions. All of the biggest savings can be found at the hotukdeals Nike Air Max pages, where footwear lovers are always posting new information about reductions across the UK and worldwide.